Just like Vanessa Williams, I'm--wait for it--saving the best for last in the ol' Spring Shopping Guide. (And if you guessed that I'm continuing the '90s theme with the #4 song of 1992 according to Billboard, gold star for you.) So I'm rounding things out with another '90s throwback, the drawstring bag. Last seen draped over the shoulders of Supermodels (think Linda, Christy, Naomi) before those black nylon Prada backpacks took over, drawstring bags--often closely related to bucket bags--have that perfect, elusive combination of luxe and effortless. Which is what every bag should have, shouldn't it? Jerome Dreyfuss's bags are what I like to call quietly luxurious--they're not covered with flashy, easily recognizable logos, but they're incredibly well made, from supersoft, buttery leather and cool finishes. They also have cool names, like the Alain Punk bag, which sounds like some French '80s pop star. Even better than its name, however, is the adjustable strap, which goes from a crook-of-the-arm 4 inches to a shoulder-perfect 16 inches. 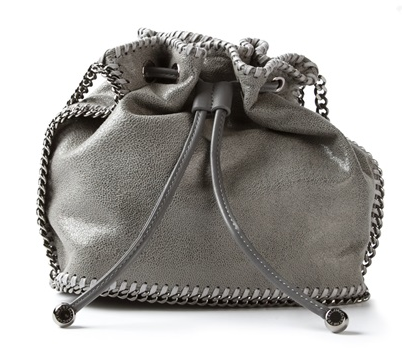 Speaking of cool finishes, Stella McCartney gives Jerome Dreyfuss a run for his money. Now, this drawstring bag is about half the size and not actual leather, however it's perfect for the weekend or, if you carry a light load, even for the weekdays--a bonus with drawstring bags is that they tend to hold a lot more than you'd think. Speaking of which, Phillip Lim's Scout bag has made an appearance here before; last year, I opted not to get one, but that was before I learned to pare down. 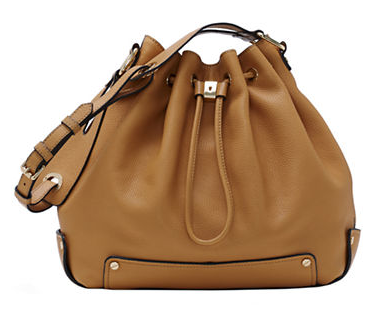 I like that the metal-edged corners give it a more structured, modern shape--it's the anti-drawsting-bag drawstring bag. 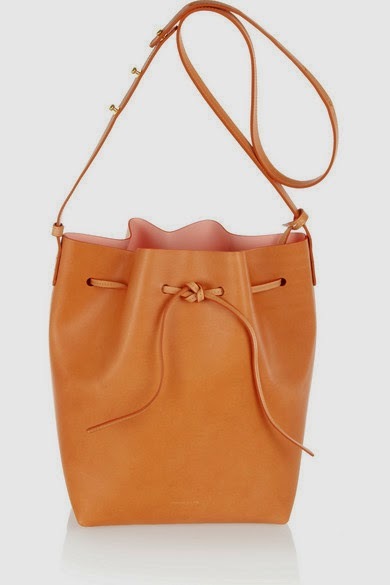 Which brings me to this season's It Bag and the reason for this entire post: the Mansur Gavriel bucket bag. I have one, and it was not easy to procure--I was on three different waiting lists (one of which was expecting a shipment in July!!) but thankfully not for terribly long. The bag itself is pretty stiff, which is a good thing because it won't get all droopy, and I also expect it to age beautifully. Which, for the price (which is enough to be a splurge but not too much to break the bank), it should. 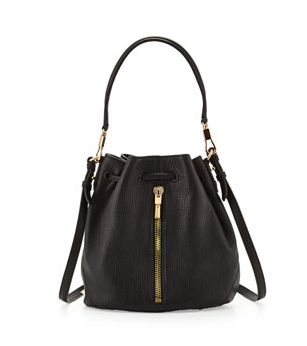 Along those lines but a bit more reasonably priced is Vince Camuto's Jill bag, a nice luggage color (also available in a hot red, among others) and a more squat shape, which is better for carrying higher up on the body, if that's what you prefer. The leather is also nice and smushy, saving you much breaking-in time. Everything Elizabeth and James does is on-trend, but in a tasteful, mellow way. 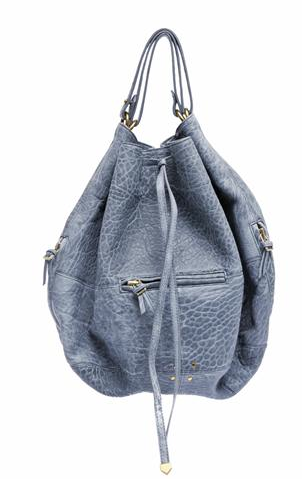 This Cynnie mini bucket bag gets the drawstring shape right, but then elevates it with that big, shiny zipper. I also like the two-strap option, as well as the not-huge scale. Restraint--it's a beautiful thing. 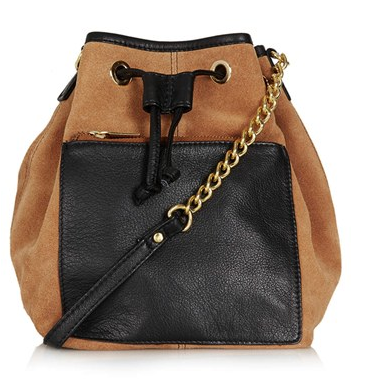 I like the two-tone look (as well as the chain strap) of this Topshop bag, which is inexplicably $68 and actually leather. Side note: the Nordstrom here in SF has a somewhat edited Topshop department, which I enjoy shopping far more than any actual Topshop store. Discuss. 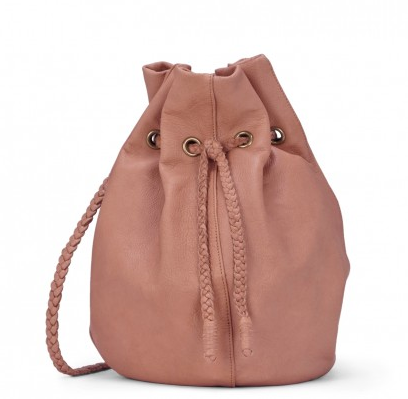 While this section is starting to sound like I Can't Believe It's Leather, this $90 Sole Society Montana bucket bag is also, in fact, leather. It's a bit on the floppy side and has that "I'm going to Coachella" vibe, but, hey, a leather bag for under $100 ain't bad. 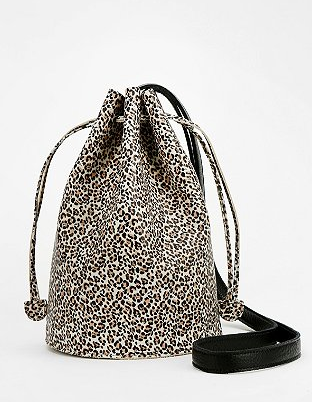 If you want to have fun with this trend (and really, why shouldn't you), then Baggu's animal-print bucket bag is the way to go--especially now since it's on sale (I was originally going to feature it in the mid-priced section of this post). Even though it's animal print, it's pretty neutral, and more importantly, it's just a cool bag.